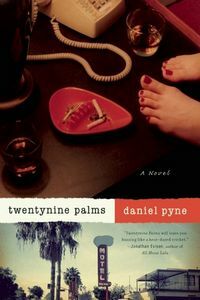 Twentynine Palms by Daniel Pyne, a Mysterious Review. Review: After underemployed actor Jack Baylor breaks off an affair with his best friend's wife, he runs off to the California desert community of Twentynine Palms … only to be drawn into a missing persons investigation in which the local police consider him the prime suspect, in Twentynine Palms, a novel of suspense by Daniel Pyne. Soon after arriving in Twentynine Palms, Jack meets Mona, a single mother with two children, with whom he has an instant attraction. But afraid a making a commitment he can't keep, he feigns an audition in Hollywood and makes plans to leave. Agreeing to one last night together, he instead takes off early. Mona goes to the motel room where he had been staying, only to discover Jack's friend Tory, who is there to kill him. The police later discover Jack's room sprayed with blood, Mona and her kids missing. Believing Jack to be responsible, the police quickly find him and place him in jail. But a fortuitous sequence of events allows Jack to escape, now on the run from both the police and Tory. Twentynine Palms is a noir-ish thriller with comic overtones. The narrative is edgy, the characters sharply drawn. A prologue introduces Jack and Tory, and describes their rocky friendship as youths. Tory's violent behavior is illustrated by a scene in which he causes Jack to be blind in one eye. It's never quite clear why the two remain friends over the years, what bond they share, as their careers and lifestyles took off in vastly different directions as adults. At some level, the story probably wouldn't be much different if Jack and Tory were strangers, thus it seems something — something rather important — is missing here. Then there's Rachel, a 14-year-old girl that has run away from home and whose path crosses Jack's. Her presence isn't integral to the plot in any meaningful way, and their relationship is akin to brother and sister; in fact they introduce themselves as such when forces to explain why they're together. There might be some overall message here — something along the lines of, you can't run away from your problems, whether you're a teenager or an adult — but if that's the intent, it's weakly handled. Twentynine Palms is a creative thriller, but one that seems surprisingly tame despite its colorful, sometimes outrageous characters and the frequently imaginative elements of its storyline. Acknowledgment: Counterpoint Press provided a copy of Twentynine Palms for this review.